Reviewing Yann Martel's latest offering got me thinking of a mythical phone conversation Yann should have had with his agent. Agent: Keep talking, Yann-baby. This has Booker-bagging written all over it! Yann: ... as a fable of the Holocaust. Yann: No, no. It'll be great - because I'll bring together that essay I was writing about the Holocaust and create a way of re-imagining the history the way Camus and Orwell did. I stayed away from Martell's Life of Pi as long as I could, because it was always being forced on me - usually by a dreadlocked friend who said it had changed their life. I'd usually shrug and say I'd keep it handy for when my life - like a flat tyre - needed changing. But I have to acknowledge that Pi was a hugely successful book and had some great writing in it. 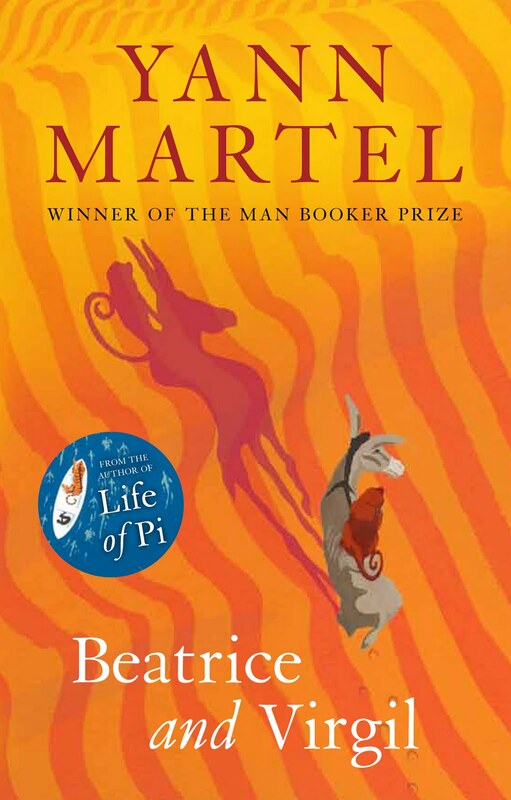 Beatrice and Virgil Martel references his Pi success using the character of Henry - successful author who want to write about the Holocaust but gets snubbed by his publisher and looks to enjoy life outside of writing. He wants to write a book in which "The unwieldy encumbrance of history was reduced and packed into a suitcase." Except that some people don't want the Holocaust in a handy travel size. Henry meets a taxidermist who seems to be embarking on a similar project in a play with donkey Beatrice and monkey Virgil journeying across their country which is a giant shirt that represents 20th century history. They attempt to create a sewing kit to repair the shirt which includes tools they'll use like "empty good cheer expressed in extremis" and Aukitz - a corruption of the Nazi camp. There's some things I really liked about Beatrice and Virgil. It switches between play and narrative plus throws letters, skimmed short stories and signs at you to keep your eye on the page. There's insight into how/why we dehumanise killing and torture then pushes the reader back into thinking about these experiences by finishing with the "Games for Gustav" conclusion. And the cover design is a triumph keeping the play at the front of mind everytime you pick it up. But it doesn't hold together as a book. The characters are all flat with the exception of the autobiographical Henry. The animals are interchangeable and the taxidermist's "let my play do the talking" is snide take on conceited authors but is dull. The narrative points in a fairly obvious direction and the play's absurdist bent strikes a wrong note against the everyday strumming of Henry. When the plot does twist, readers shrug. As an author Martel's attempt to advance his writing, to push towards a new kind of writing for himself is a worthwhile project. But he doesn't live up to the heights of Orwell, Camus, Speigelmann or Dante - all of whom he refers to in this book. Martel does beautiful line-by-line writing but there's nothing here that adds up to a novel. Maybe they should have gone with the flip book. This review is based on a live discussion at the Victorian Writer's Centre Club Writers.